Over the weekend of 8th – 10th February, Leicestershire Rugby Union have been delighted to host 3 guests from the Croatian Rugby Union. In 2013, Leicester were proud to be chosen as a host city for the Rugby World Cup with 3 of the qualifying games being played at the Leicester City Stadium. As part of the RWC legacy, constituent bodies across the country were partnered with countries who are striving to grow the game of rugby union and may need some support and assistance from the home of rugby and where the sport originated. Leicestershire and Warwickshire were partnered with Croatia. With 22 clubs and teams consisting of both men and women, rugby union in Croatia is steadily growing across mini/juniors, schools and 7’s in addition to the full 15 a side game. The Croatian Rugby Union have identified that in order to grow their game for the future, they need to create better links with children and schools. This is something Leicestershire do really well. Many of our clubs have very strong Age Grade Rugby sections and an area Croatia have asked for guidance. A full weekend of showcasing our game in Leicestershire was on display for Veceslav Holjevac, General Secretary, Petra Druscovic, Game Development and Ivana Maras, Marketing and Comms. Starting on Friday evening, our guests were invited to attend a County Cup Semi Final between Hinckley RFC and Ashby U15’s. 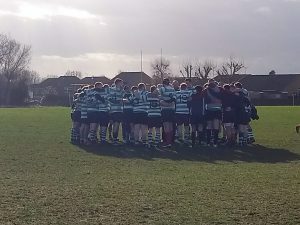 The match watched by around 200 spectators saw Hinckley reach the final against valiant opponents. Liz Cawson who heads up the section shared her views with the delegation along with parents and the county safeguarding team. Saturday morning was an opportunity for a range of representatives from across the county and clubs to present their experiences and knowledge from different perspectives. 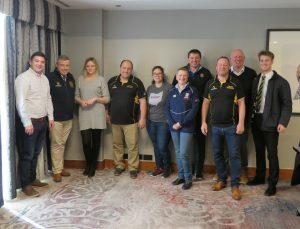 This was a relaxed morning with speakers presenting and taking questions on a range of topics, notably – school interaction, player development pathways, volunteering, club recruitment and retainment, a player’s perspective on transformation from Age Grade to Senior Rugby and marketing, communication and branding. It was a very productive morning and one which could have easily continued for the whole day as lots of questions were asked and the gathering felt motivated and enthused with positivity from both Croatia and Leicestershire. One thing that was very clear form the session was that children are key to the growth and sustainability of our game. Included is the value volunteers also give to game. Helen Wrighten, Volunteer Co-Ordinator for Leicestershire, told the team from Croatia about the various ways in which we recognise and celebrate volunteers and without them, we could not do what we do. Following a great morning of discussion, our three Croatian colleagues were guests at South Leicester RFC to help them celebrate their centenary. After a luncheon and speeches, South Leicester exchanged plaques and gifts with Veceslav before everyone went outside to watch the first IV play Stourbridge and the second IV play Aylestone Athletic in a re-match from 100 years ago. Both teams are celebrating centenaries this year, so it was a fitting tribute to play the match again. Although the players may not have been ‘original’, we did see some past players put on their boots once again and have a bit of a run round to aid the celebrations. It was also a great opportunity for the Croatians to chat to members of a local club about their experiences. A good crowd came along to support both matches. The first IV had a difficult game against Stourbridge. It has been a tough season but was great to see a very full clubhouse, and it was clear to see the loyalty of the members and their friends and families is strong. Sunday 10th February was an early start once more to travel to Twickenham for the 6 Nations match against England and France. A pre-match meal was organised and an opportunity once again to chat with more associates from the game. 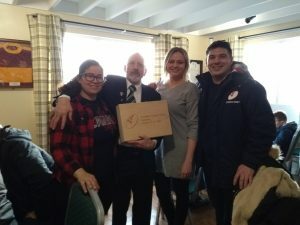 Peter Howard, Leicestershire RFU Council Member introduced the team to Tracey Edmundson, NLD RFU Council Member who worked with Belgium in a similar partnership. She explained how they were able to advise on a strategic plan to give Belgium something to work to and drive the game there. Our guests had some free time to meet up with some of their Croatian friends and colleagues who are in the UK before everyone sat down to enjoy a spectacular display of rugby from England, with an opening try from Jonny May in the first minute of the game. 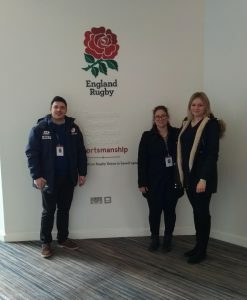 After a packed weekend, Veceslav, Petra and Ivana have gone away with copious notes for how they can continue to drive rugby union in Croatia and with the passion they have for the game, they have a great team to do that. We will continue to support Croatia with their ventures and remain their friends and partners and look forward to watching their development over the coming years. Thank you to not only Croatia for being such fantastic, welcoming colleagues, but also to the volunteers and clubs who have assisted with making sure this weekend was a great display of the excellent work we do in Leicestershire for the game we all love. The winner, as always, is rugby union.